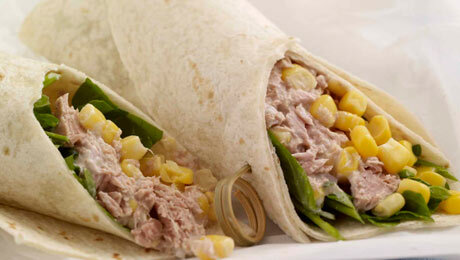 Tuna and sweetcorn is always a winner. Place the tuna fish into a small bowl with the onion. Add in the sweet corn and the mayonnaise and mix well. Season as required with salt and pepper. Lay the tortilla wrap on the chopping board, spread lightly with a little bit of mayonnaise and then place some of the mixed lettuce leaves on top of that. Top with the tuna and sweet corn. Then roll them up tightly and securely, with a cocktail stick if required.